Successfully Added Multimedia Projector and Media Player with Remote to your Shopping Cart. Portable Multimedia Projector and Media Player with LCoS (liquid crystal on silicon) micro-display technology for high contrast and higher resolution images. This multimedia projector offers the highest quality while maintaining its light weight and handheld portability, so you can take it anywhere and use it for anything. 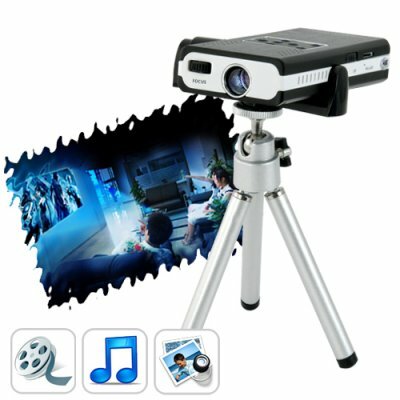 This multimedia projector is easily connected to other devices, so the possibilities of use are endless. The AV IN slot allows it to become the perfect accessory to use with game consoles, MP4 players, MP6 players, portable DVD players, video playback phones, and most anything through a simple plug-and-play RCA cable). Feel free to connect the multimedia projector to your PSP for some extreme gaming or just share some of your iPod's photos and videos with your friends and family in high resolution. Built-in media player: The native media player inside this multimedia projector plays an array of media file formats, including AVI, RM, WMV, and MPEG4. That means along with the 4GB of built-in flash memory and an additional micro SD slot, you can store all of your favorite movies and other media files on the projector and play them whenever and wherever you want. Extreme portability and versatility: The special slim design of this multimedia projector enables it to fit nicely into your laptop bag so you can take it with you wherever you go. Along with the handy mini tripod mounting stand, you can use the multimedia projector in a wide range of conditions and applications and not only does it make for a complete home multimedia unit, but it is also ideal for business and personal use. Take it to a friend's house and enjoy a Star Wars marathon over a bowl of popcorn or bring it to the office for your next big presentation! This multimedia projector can actually replace your current TV and is great for the business person who likes to hold meetings in his office or the game player and movie fan who does not want to spend over $1000 on a new large screen TV. Order today and we'll ship it out tomorrow along with our famous 12 month warranty. Brought to you by the leader in China Electronics - Chinavasion. Yes, however you will need to charge it through the power adapter. You cannot play while charging through the USB as it will turn into file transfer mode. How do I turn this multimedia projector on? When turned on, the projector is waiting for AV input. If you hold the "play" button for a few seconds, it will switch into media player mode and you can play your media files from the internal memory or external micro SD card. Hold "play" for a few more seconds and it will go back to projector mode. How come my Windows 7 and Vista machine doesn't recognize the device? Are there drivers? First, turn the multimedia projector on, then switch to media player mode. Finally, plug in the mini USB.